Watchdog Says Billions In Afghanistan Funding At Risk Of Misuse : The Two-Way Funds in the Afghanistan Reconstruction Trust Fund are at risk because the World Bank is not adequately monitoring how they are used. The U.S. has contributed $3 billion to the fund. 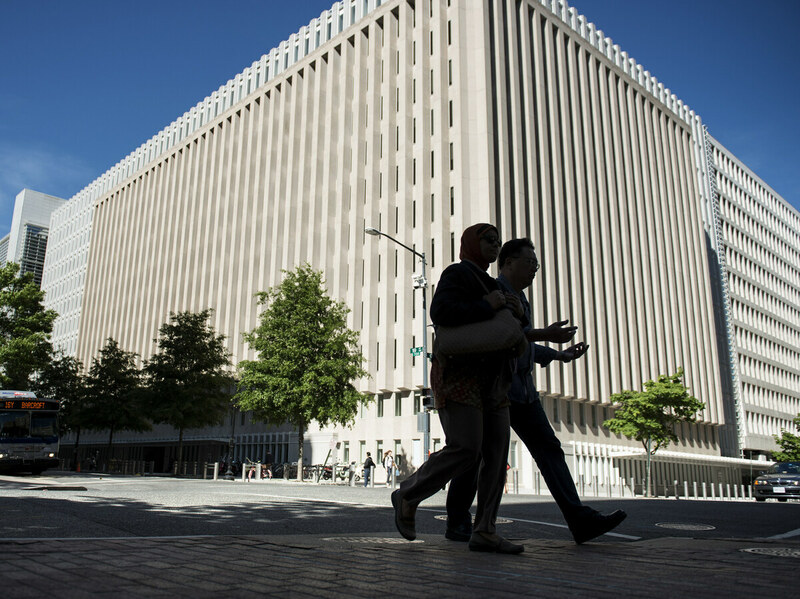 People walk past the World Bank's headquarters in Washington, D.C. A watchdog says that the World Bank is not adequately monitoring how funds intended for Afghanistan reconstruction are being used. Over the course of 15 years, the U.S. has contributed more than $3 billion into a trust fund that is aimed at helping Afghanistan with its reconstruction. In total, donors from around the world have given the Afghanistan Reconstruction Trust Fund, which is administered by the World Bank, more than $10 billion. But according to a watchdog appointed by Congress, those billions of dollars are at risk because the World Bank and the government of Afghanistan are not adequately monitoring where they go and how they are used. "Once the U.S. or any other donor provides its contributions to the fund, neither the World Bank nor USAID can account for how those funds are specifically spent," said the Special Inspector General for Afghanistan Reconstruction in a statement. SIGAR is tasked with monitoring U.S. spending in Afghanistan, and the U.S. provides money to the fund through USAID. The ARTF describes itself as the "the largest single source of on-budget financing for Afghanistan's development ... delivering important results within key sectors including education, health, agriculture, rural development, infrastructure, and governance." It does not fund Afghanistan's security sector. The funds from the trust fund are used to pay salaries of Afghan government workers, SIGAR says, but the World Bank does not require a third-party monitor to physically verify that those government workers actually exist. The third party contractor's work is limited by security concerns because they are not always able to verify workers in insecure areas, the report states. The World Bank also does not publicly share evaluations of the third-party contractors who are monitoring how the money is used. "Donors, including USAID and U.S. taxpayers, will continue to provide billions of dollars to the ARTF without adequate assurance that the money being spent is actually contributing to the ongoing operation of the Afghan government, addressing fiscal gaps in Afghanistan's national budget, and furthering the international community's overall reconstruction efforts," the report states. The World Bank also is not consistently measuring performance of projects funded by the ARTF, according to the watchdog. "Without an accurate, reliable evaluation, the World Bank will be unable to determine the impact the roughly $10 billion in donor funding has had in improving Afghan development." The fact that there is apparently little accountability for how the money is spent has an impact on the projects selected, according to the report: "A senior aide to Afghanistan's President told us that the structure of the ARTF allows for ill-conceived projects to be funded because there is no repayment obligation and that dysfunctional projects are nearly impossible to eliminate." There's political pressure to spend the money, the aide reportedly said, "even if the programs and projects being funded are ill-conceived or unneeded, or risk losing future funding." The World Bank responded to the report by saying that most of its findings "are somewhat anecdotal, and do not fully take into account measures taken to improve the reporting on how funds are used." "Independent assessments conclude that in Afghanistan's volatile context, the ARTF is a vehicle of choice for pooled on-budget funding given its low transaction and management costs, transparency and accountability," the World Bank said in a statement. "It provides a well-functioning arena for policy debate and consensus creation between the international community and government of Afghanistan while delivering important results to millions of Afghans across the country." The SIGAR report states that the World Bank has taken steps to improve its monitoring since the last report in 2011 but there are still major gaps.